Department of Physics was started from 1985-1986 academic session for offering general degree course in the subject. 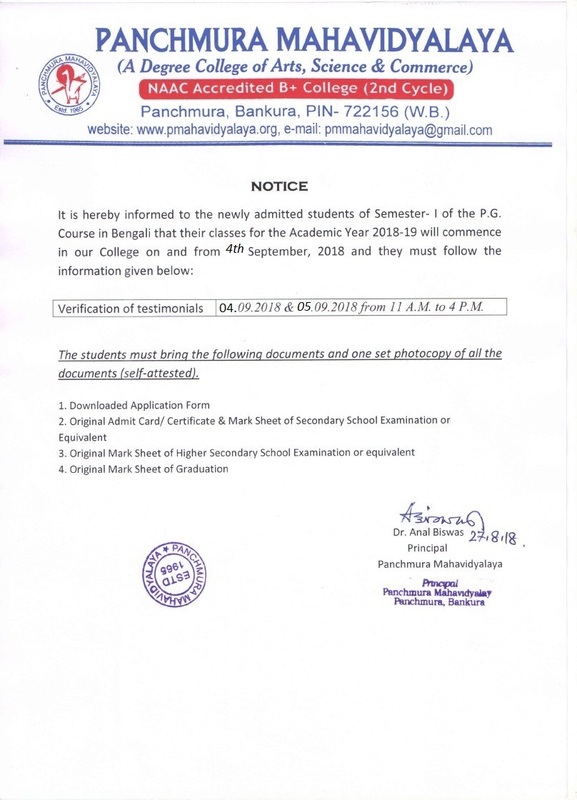 From the 2017-2018 academic session, it received affiliation for offering Honours Course under Bankura University. At present, the Department is running with four faculty members. The faculty members are well versed in the subject and dedicated to the benefit of the students. They give sufficient time to the student so that students can do well in the subject, in Examination as well as in their future life. Teacher –Student relation is also very healthy in the Department. •	Twenty students can perform experiments in batches of Two at a time in Hons Practical Classes. •	Almost all the experimental setup for Hons / GE/Programme Classes are available in the laboratory .Important & costly instruments like Digital balance ,Spectrometer, Biprism expt, Electronic experimental setups are available also. The Department prepares Detailed Departmental Teaching Plan. (DDTP) and follows it as far as practicable & follows Modular teaching method under CBCS ystem. The Department also arranges Science Quiz and seminar by the students as part of interactive teaching.